Shoot for the moon.. no pun intended! Our FIRST Fat Friday weigh in of 2011!!! Last week, we started at ZERO. Now let’s post those numbers! Eat Less and Do More. There you have it folks! The secret to weightloss, simple as that! Just like not having a flexible schedule kills me, not having flexible eating habits will equal weight-loss failure for me. Everyone is different though. Some need a strict regimine they can follow, and voila, the weight comes off. My husband and I decided to “count calories” to try to accomplish this. At first I was nervous. Do I REALLY have time to count calories? REALLY REALLY? But after the first couple of days, it became kinda fun. We gave ourselves a 1500 calorie per day limit. Within that limit, we pretty much eat what we want. But I know when I eat something “bad” it wastes a lot of my calories which means I get to eat less. So I am always on a quest to find the “cheapest” calorie food, so I can get the most bang for my count! That’s right, the calorie tracking app! On MyFitnessPal, you can track your “do more” too, although I haven’t progressed to that level of fancy yet. I like it because it adds the calories for me. If you have a smart-phone with a camera, you can scan barcodes and it automatically pops in the calorie and nutrition content of the food you are about to partake of. You can note how many servings you want too! You can also search for food by name, or enter your own in manually. It’s GREAT if you’re going out to eat, that’s what would always kill us when we tried to calorie count. Before, I was doing a lot of Googling for calorie counts! You can ALSO “friend” people… yeah, like we need another place for that! But… it’s a way to encourage each other and share your progress (and get a kick in the pants when you blow it!) I’ve yet to friend anyone, so don’t know how that part works really, but I’m kristaphillips if you decide to try it! OH! And if you don’t have a handy dandy app phone… you can also use their online version at myfitnesspal.com as well. Are you sitting there telling me about how LITTLE time you have and how much work this sounds? I gotta tell you, it takes me maybe 10 minutes at the most out of the day, and usually it’s less than 5. Really truly. Somedays it is more (and if you have complicated recipes, it might be… I cook simple!) but you can also “save” recipes in there so if you have a famous lasagna you make, you can enter it in there and calc the calories and save it for next time, so you only do the work once. And no, they aren’t paying me to say this, it’s just really helped me when I switched from “on paper” tracking by saving a BUNCH of time. But if paper is your thing, go for it! Calorie counting isn’t for everyone, I know. What works for one might totally be a failure to another. Regardless of how you do it, to lose weight, you have to eat less calories. Bottom line! Discussion: How are YOU doing the “eat less” part of Fat Friday? Is there a diet you’re trying? A method you’re using? Share what is working (or not working!) for you! Yay, Krista! You're doing awesome! I've been stuck at the same number for a couple weeks now. I thought this week might be my get-back-to-fitness-classes week, but alas, sickness has invaded our house. I've worked out when I could, but not as much as usual. Oh, and good for you counting calories! I did that for a while, and it was a great way to get myself back on track. I'm not doing it anymore because I got comfortable with knowing the general range of where I should be. I may have to go back to that strategy, though, to get rid of these last 5 lbs, LOL. Hurray for your progress! My husband shed about 30 or 40 pounds very easily by cutting out on sweets and non whole grain carbs and drinking tons of water. Best wishes for your next week! Way to go, Krista! You're doing fabulous! I signed up for an account with SparkPeople a few weeks ago, but haven't really done anything with it. I plan to start using that this coming week as well. 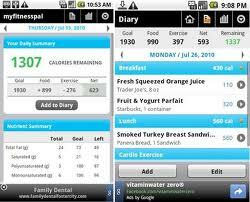 It's similar to the app you were talking about–you can track your food intake, exercise, make goals, etc. Sarah.. yuck for sickies! Praying this next week is germ free and MUCH better for you, my friend! Lis, YEAH for your husband! That is fabulous! Ralene… we ALL have zero weeks. And that is totally okay! LIFE HAPPENS! The key is to not let it get you down, and KEEP GOING! Great job Krista and Scott (and Ralene, too for at least not being on the "positive" side of zero.). I'm really thinking it probably would have been -2; however, we took our sons to a go-kart track last night and we decided to eat there. At first, I was just going to have my salad with a breadstick (honest) but the pizza was just too tempting with the loads of gooey, melted cheese and crisp pepperoni. I ate 3 slices!!! At least my Mountain Dew was diet! OMGOSH! I'm +4.4 this week! Gotta actually pay attention to what is going in my mouth. Ugh. I've also had WAY too much Coke trying to stay awake. Crud. Hi Krista! I decided just today to try to lose a"few" pounds[after trying to button my jeans]!!! Well i did it , but uncomfortably tight!So i joined my fitness.com and lets just say that after putting my info in and what i have ate so far today and no exercise , that well I really shouldn't eat supper ,But tomorrows another day !!! for me it has to be baby steps…..
Valerie… that's what I love about you! Pure honesty! One of the things I've also done is cut WAY back on pop. This was needed for finances AND weight. SO now, we buy a 2liter for the whole family on "pizza" night, but that's it. Once in a while, I'll have one at a restaurant, but other than that, I'm a water-a-holic now. Aleisha… welcome to fat friday!!!! I TOTALLY understand the "crap, my pants are too tight!" feeling! YOU CAN DO IT!!! I started running about 6 months ago and someone recommended mapmyrun.com. You can map your walks or runs in your neighborhood or wherever and it will tell you how far you went. This helped so I didn't have to take the same path every time to get the same results. Awesome job on your 3 lbs!! My number for this week is -1.6… Yeah!!!! Zimms zoo… I'll have to check that out! Currently I'm doing little walking or running… it's been too cold to take Annabelle out with me! I was looking forward to less hot temps so we COULD… and now it's just turned too COLD without the inbetween! Blah! This year—I have lost 50 lbs!! I was found to be Vitamin D and B deficient and so we have worked on that and it has made a huge difference! I have been trying to focus on the "do more" side of things. I rejoined the gym and I have been doing pilates at home a few times a week. When I was working to lose my baby weight (and then some!) after Charlotte I found that tracking calories was the best thing. I still use the tweet what you eat site on Twitter when I gain weight. I think it makes such a big difference when you pay attention to what you eat.